Frame marquees – available in 3, 6, 9, 12 and 15 metre wide sections. These offer maximum flexibility with the greatest safety. Frame marquees are also space efficient so they can be set up in even the most awkward areas regardless of ground surface. Their flexibility means that you can create different zones or even rooms within rooms allowing you to utilise all available space. 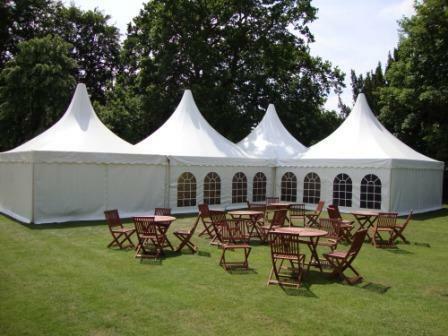 Chinese hats – pretty pagoda style marquees which are perfect for use as reception areas or small parties. For a classic look we can join them together creating a stunning venue. 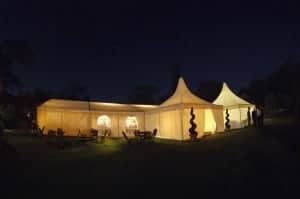 Traditional marquees – traditional or “pole” marquees are the original marquee structures that are supported with large poles inside the marquee and guy ropes around the outside. The guy ropes need about 6-8 feet of space around the marquee and can only be situated on grass. They come in widths of 10′ to 50′ and can be lined if required. The poles and guy ropes mean the infrastructure is not as strong as the framed marquees and are therefore better suited to summer conditions.